I love weekend breakfasts. Truly, breakfast is my favorite meal, and during the week I rotate through oatmeal, bowls of fruit with quinoa or wheat berries, and even the occasional fried egg with toast. Weekend breakfasts are a whole other meal though. The goal is no longer just to fuel you quickly on the way out the door. Rather, weekend breakfasts for me are about relaxing, and taking the time in the morning to cook something delicious to start the day off on a happy note. I like french toast and pancakes for my weekend breakfasts, but always with a twist to make the meal a little special. These were Mark Bittman’s Cornmeal Pancakes. I left out the pinenuts, and subbed in 1/4 cup of polenta for some of the cornmeal. Also, be careful with the NY Times version of the recipe, which leaves the boiling water out of the ingredient list. Forget that, and you’ll make corn colored cement cakes instead. Luckily, on a lazy Sunday morning you’ll have plenty of time to rectify that mistake. 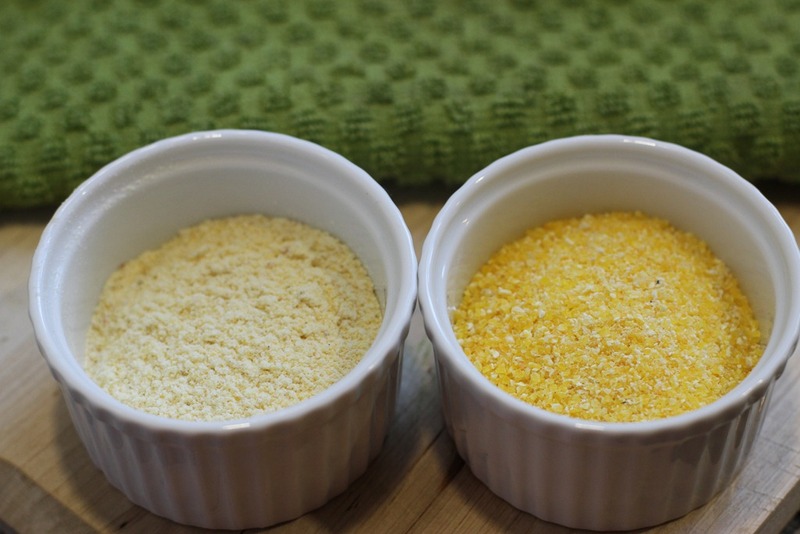 The left is cornmeal and the right is polenta, which also has a coarser grain. Subbing in some polenta added some extra texture to the pancakes. The cranberry clementine syrup was inspired by a pancake topping my friend Emily made for us several years (and apartments!) ago. 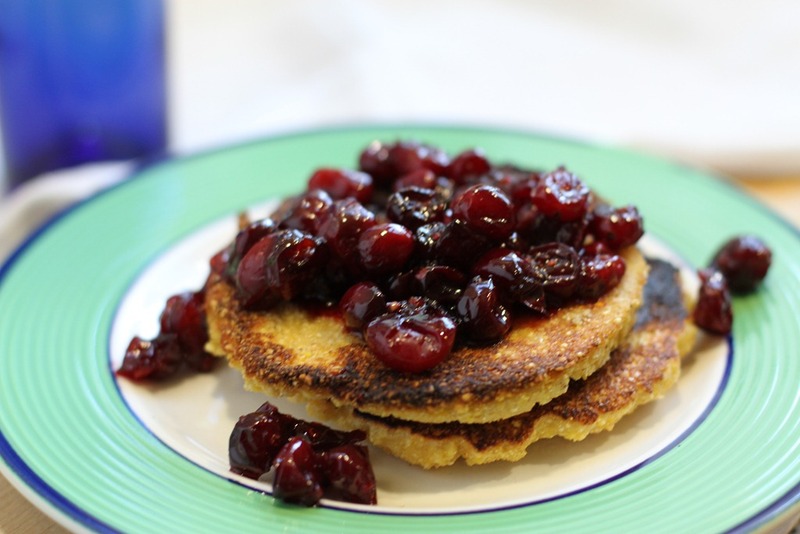 I thought the cranberries would go well with the cornmeal based pancakes, and improvised from there. This tart breakfast topping makes a nice addition in both taste and color to pancakes or French toast. You could just as easily sub in one orange for the two clementines; I just happened to have clementines on hand, and appreciated the alliteration of cranberry-clementine syrup. Add all the ingredients together in a small saucepan over medium heat. Serve over pancakes of your choice. 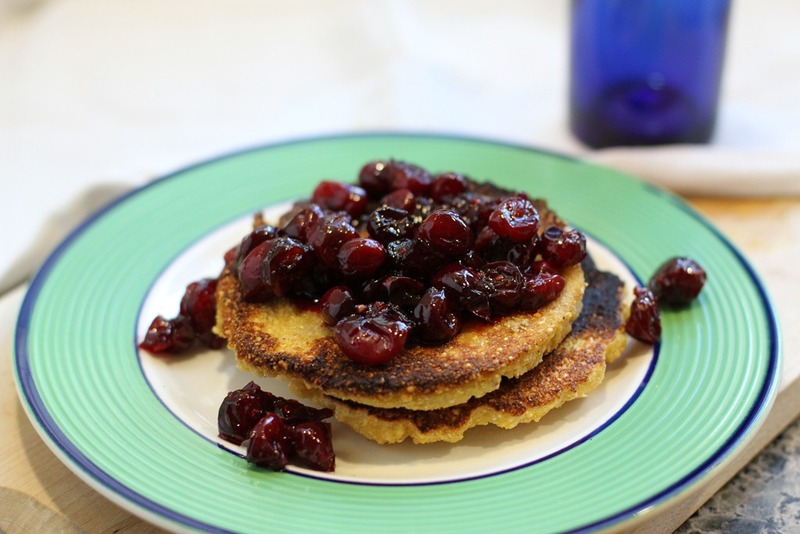 This entry was posted in Food, Recipe, Uncategorized and tagged breakfast, clementine, cranberry, food, pancakes, polenta, recipe. Bookmark the permalink. What a cool idea – both the cakes and the syrup! I really like your blog and my favorite breakfast treat is homemade Belgium waffles topped with vanilla bean icecream and fresh fruit. Its delicous! It is by far and away my dream breakfast. Thank you so much for your comment, Jessica! Your favorite breakfast treat sounds delicious! My boyfriend swears that he can barely tolerate sweet things, yet he somehow makes an exception for a chocolate chip Belgian waffle topped with maple syrup, chocolate ice cream and whipped cream. Such a breakfast certainly sets a celebratory tone for the weekend!